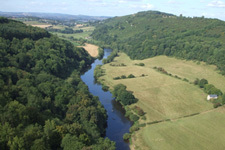 Symonds Yat East is well situated for day trips to Hereford, Ross-on-Wye, Monmouth, Gloucester or Ledbury. There are many castles nearby such as Goodrich, Raglan, Eastnor, Chepstow and Tintern Abbey as well as attractions such as Clearwell Caves, Puzzle Wood, The Amazing Hedge Puzzle and the Dean Forest Railway to name a few. On our doorstep there is plenty to do without having to drive, perhaps a walk past the rapids and down to King Arthur's Cave or why not hire a Canoe or Kayak for the day or maybe take a really interesting River Cruise upstream for a while. You may even be tempted to walk up to Yat Rock for the most spectacular views you will ever see of the Wye Valley and see the Peregrine Falcons nesting in the rock face. Then again you may just fancy a few drinks and an excellent meal in either the Saracens Head Inn which is next door to us or at the Royal Hotel which is a short stroll along the riverbank.